Sony introduced the Walkman in 1979, and I got mine a year later. The Walkman boosted the profile of audio cassettes, which had been challenging LPs and 8-Tracks as a music medium. They soon dominated the music scene. A $185 TSC-300 I bought from J&R, my Walkman was also a stereo recorder. (Note the spiffy name—even when it was clueful, Sony was clueless.) No way you could put it in your pocket—it was about the size of a trade paperback book. But the music sounded great, and it doubled as a very solid, if bulky, recorder for interviews. As now, people had all kinds of exotic car-stereo rigs, but as an impoverished writer I outfitted my 1972 VW bug with a minimal unit (a no-name brand for $99) that I bolted under the dashboard and wired up to the speakers. Not pretty, but I could control what music I heard in the car, which was actually a novelty then. The other big advantage of cassettes, of course, were that they were recordable. You'd buy blank 90-minute cassettes (chrome high bias, if you were an audio nut) and tape one album on each side. (Since most records were shorter than 45 minutes, you'd grab a song or two from another album to avoid a long dead spot before the tape reversed.) And you'd borrow albums from friends and tape your own. You could also tape from other cassettes, but the quality degraded each time you made a copy made from a copy. It was like an organic form of DRM. Everybody had a box with hand-labeled cassettes and before you went on a car trip you'd dig in the box to find the tunes that would soundtrack your journey. Cassettes weren't the most reliable technology—it was pretty common for the music to stop and then, when you tried to eject, the player wouldn't give up the tape. You'd use brute force, and sticking out of the plastic would be a tangle of brown spaghetti. But even though audio cassettes supposedly degrade after 20 years or so, I still have a couple in my car that I made in the '70s—one of the early Stones, taped from the mono originals, and a Neil Young tape with "Tonight's the Night" on one side and "On the Beach" on the other. Neither has lost its magnetism, physically or psychically. The cassette era was a big setup for the age of iPod, a pocket-size digital device that was not only a playback unit, but the equivalent of a room-size cardboard box full of tapes. And, of course, Napster, which made the whole world into a big cassette-tape-swapping community, where everything was free. Steven Levy is a senior writer for Wired, most recently writing about Google's ad business and the secret of the CIA sculpture. He's written six books, including Hackers, Artificial Life and The Perfect Thing, about the iPod. In 1979, he had just left his first real job, at a regional magazine called New Jersey Monthly, to become a freelance writer, and had yet to touch a computer. 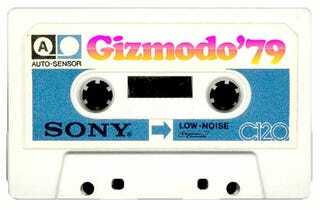 Gizmodo '79 is a week-long celebration of gadgets and geekdom 30 years ago, as the analog age gave way to the digital, and most of our favorite toys were just being born.